Like Wednesday’s chocolate covered gummi bears, these Gummi Bear Dips were free samples given to me by the folks at the Koppers booth at Sweets and Snacks. They came in two flavors, orange and raspberry. 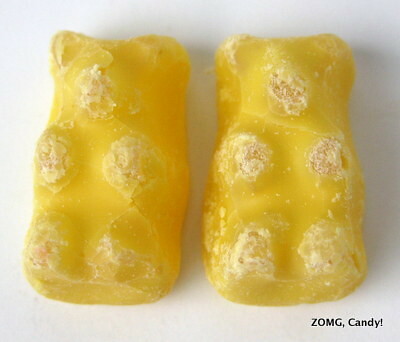 Orange was “real Swedish gummi bears covered in creamy orange coating.” The orange coating was actually yellow in color, while the bear inside was a translucent gold. 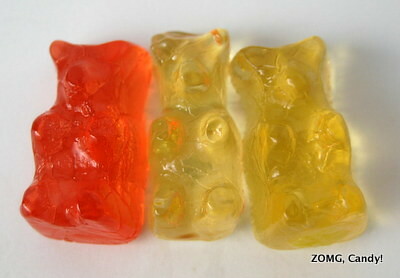 I think the center gummi was a slightly larger version of the milk chocolate covered gummi bear (the left to right order in the below photo is naked-fied raspberry, milk chocolate covered, and orange). It was similarly bouncy in texture, with the same light, generically sweet fruitiness. The thick and stiff orange coating was quite creamsicle-y, with a flavor that was heavy on the cream. The orange contribution was just a light citrus oil tinge. I don’t know if the orange coating actually improved the bear, but it didn’t hurt. 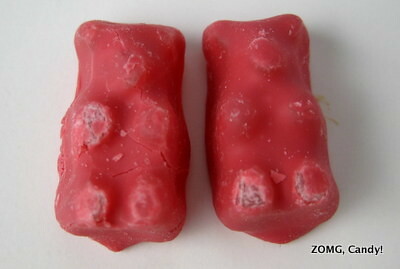 Raspberry looked like it would just be a differently flavored equivalent of the orange dips: the bear was the same size as that of the orange, only red instead of gold and with a strong and sweet fruit flavor. I think cherry? The raspberry coating, however, was intolerable. It tasted super fakely sweet with medicinal bitter notes and a grainy melt. I couldn’t stand it and really had to fight through the distaste to get that naked gummi photo above. Candy raspberry and I just don’t get along, I guess. I appreciate that Koppers was trying to do something new with these guys, but I thought the dip factor was innocuous for the orange (an O) and detrimental in the case of the raspberry (a —).